It looked like the kind of happy accident that turns a season when Liam Canavan came on to score with his very first touch, writes Paul Okey. With Kieran Dunbar poised over a 52nd-minute free-kick, Paul Holleran was forced to introduce the former Kettering midfielder in place of an unwell Callum Gittings. Canavan barely had time to reach the box before keeper James Belshaw palmed away Dunbar’s awkward dipping effort. Nevertheless, he was quickly on the scene after Daniel Udoh had failed to force the loose ball home, converting from close range to cancel out Mark Beck’s 31st-minute opener. Sadly for Canavan, despite some neat touches in the centre of the park, he quickly went from hero to zero, missing an open goal and then a penalty, both of which would have major bearings on the outcome. However, while the peaks and troughs of Canavan’s eventful cameo were influential, Holleran was clear where the game was lost, pointing to the lack of concentration which allowed Town to restore their lead two minutes after being pegged back. Despair for Canavan and Ahmed Obeng after two gilt-edged chances go begging. “We got the goal to equalise and you think hang on, this could become interesting now,” said Holleran. “But the stats will back up that teams are most vulnerable after scoring a goal and our game management simply wasn’t good enough. “There were a couple of occasions where we could have cleared our lines. “And for us to compete and to stay in this division we’ve got to get back to keeping clean sheets - it’s got to be harder. That Brakes had only given their second-placed visitors a one-goal start came as something as a relief as the sides went in for half-time following a one-sided opening 45 minutes which had seen Brakes fail to register a shot. With Jack Edwards sitting out a ban for his sending-off at North Ferriby, Joe Clarke was restored to the starting line-up after his own one-match suspension and he immediately found himself pressed into defensive action as Town displayed their title credentials. Tony Breeden had to produce a strong hand diving to his right to keep out a Dominic Knowles shot on the turn before comfortably claiming a header from Beck. Warren Burrell got his shot all wrong after a neat backheel from Knowles, while Breeden was relieved to see Jack Emmett’s shot fly past the angle after the midfielder had latched on to his punched clearance on the edge of the box. The visitors were building up a head of steam as the game approached the half-hour mark and George Thomson’s ambitious volley from the angle rattled the side netting. For their lack of possession, Brakes were at least restricting Town to playing in front of them. However, that all changed in the 31st minute when a burst of pace from Emmett took him past Gudger and to the byeline. His pull-back was then slammed home from close-range by Beck, the big targetman showing he could be just as adept with his feet as he had been with his head. Content with their goal, Town sat back and allowed Brakes a little more of the play but the visitors still remained the most potent attacking force, with Knowles calling for a penalty after the ball appeared to be stopped by the arm of Jamie Hood and Thomson drawing a smart full-length save from Breeden. Harrogate had early claims for a penalty after the restart, too, with Emmett appearing to be pulled back in the box by Gudger. However, nothing was given and Town’s feelings of injustice grew when Brakes were awarded a soft free-kick on the edge of the box from which Canavan bagged the equaliser. The sides were level less than two minutes, though, Leeds United loanee Liam Kitching arriving unmarked at the far post to convert Thomson’s corner, though more by luck than judgement as his surprised celebration testified. Emmett almost made it 3-1 after a neat turn in midfield had opened up acres of space for him. However, Breeden was down well to tip his drive around the far post. Udoh used his body well to get on the end of a Canavan through ball but he went for power rather than placement and the roof of the Harbury Lane End felt the full force. 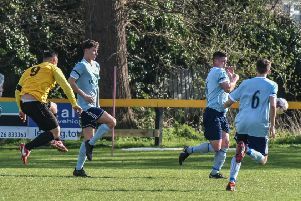 Belshaw was then called upon to acrobatically tip the ball over the bar after defender John McCombe had deflected substitute Richard Taundry’s free-kick goalwards. A smart interception in midfield from Gudger then saw him and Udoh work an opening, with the left-back’s cross palmed out by Belshaw into the path of Dunbar. His shot was blocked by a covering defender and with the defence in disarray, Canavan could only balloon the rebound over the bar from eight yards. It was to prove a pivotal 60 seconds as Belshaw’s resultant goal kick was allowed to travel all the way though to Knowles who got between James Mace and Hood and fired past the advancing Breeden. Brakes were quickly handed a way back when Kitching’s stray leg caught Udoh in the box. With first-choice taker Gittings off the pitch, Canavan took on the responsibility but Belshaw was equal to his well-struck effort, getting down smartly at his left-hand post to turn the ball away. Brakes continued to huff and puff with efforts from Canavan and Obeng crowded out but the belief had been drained out of the home side. Indeed it was the visitors who came closest to adding further gloss to the scoreline, with Joe Leesley firing narrowly wide after a neat turn had worked the space and Simon Ainge unable to convert a far-post header after Brakes had again failed to deal with a corner. Brakes: Tony Breeden, James Mace, Connor Gudger, Joe Magunda (Richard Taundry, 70), Jamie Hood, Junior English, Kieran Dunbar, Callum Gittings (Liam Canavan, 52), Daniel Udoh, Joe Clarke, Kaine Felix (Ahmed Obeng, 70).Subs not used: Kurtis Revan, Stefan Moore.